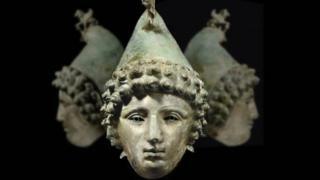 A Roman helmet described as "one of the most significant archaeological finds in Britain" is to return to Cumbria. The Crosby Garret Helmet was found on farmland near the Cumbrian village it is named after in 2010. Carlisle's Tullie House Museum hoped to buy when it was auctioned at Christie's but lost out to an anonymous bidder. It was lent for a show in 2013 and will return in April for Hadrian's Cavalry - an event featuring historical displays along the length of Hadrian's Wall. The bronze helmet, believed to be one of only three of its kind found in Britain, dates from the mid-1st to the 2nd Century AD, and would originally have been used as part of the Hippika Gymnasia, or "horse games". It features the mask of a youth whose beauty suggests to archaeologists that it could represent Paris, the youngest of the princes of Troy. It will join other unique Roman cavalry objects from museums across Europe in a series of exhibitions and events along the Hadrian's Wall World Heritage Site area - from Maryport in the west to South Shields in the east.